So I thought it might be interesting to hear how folks are storing their Rifts, or whichever VR device they have for that matter. As for me, for the longest time I would just lay it down on my desk and put a cloth over the top of it to help keep the dust off. I live in a somewhat dusty environment though, and while that helped it would still attract and accumulate some dust. Plus I was a little concerned on accidently knocking it off my desk as I have a concrete floor here in my play area. I got to looking at the case my Rift came in , it is a very nice and very durable case the Rift fits snugly down into. I prefer keeping it plugged into the PC at all times, so what I did was cut a small opening on the side for the cable to pass through. Now when I am done with the Rift, I just lay it in it's case close it up and set it on the floor by my desk. Helps keep the desktop nice and clutter free as well, and hopefully keep the Rift a little cleaner. Now I am not sure how the newer Rift bundle packaging is in regards to the case, as mine was purchased about a year ago before it became a bundle with the Touch controllers. So what do others do with their device when not using? Mine is either on top of my desk or on top of my PC (when off). If I'm travelling and taking my rig with me I will put the headset in the box it came in (like yours it came with the touch controllers bundle, etc). 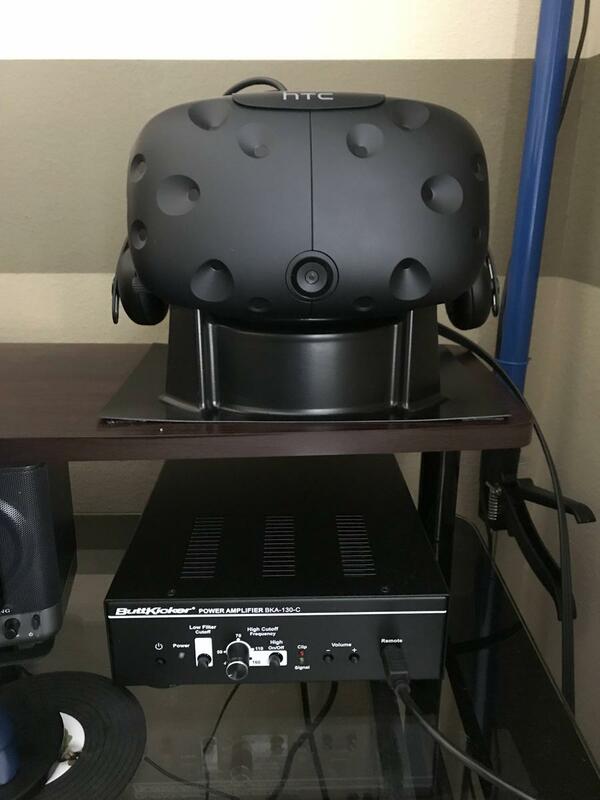 I have heard of and seen pics of people buying something like the head-shaped (bust) wig stands and storing their VR unit on one of those. That seems like a nifty idea. This is the setup I've been using - sort of a home-made hat rack concept that gives me a place for both the headset and the touch controllers. Had some dead space behind the filing cabinet that my PC and scanner are sitting on that was perfect for this purpose. 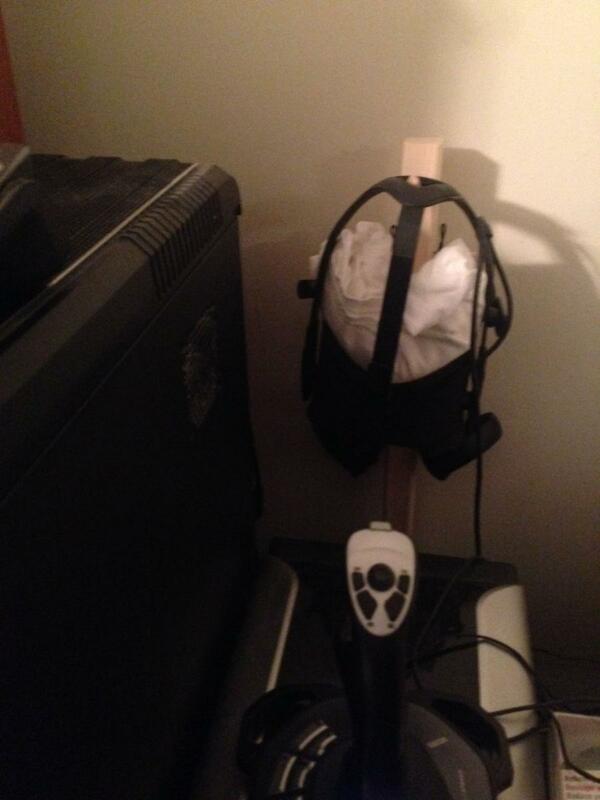 I'd used the t-shirt for running the VR benchmark tests and decided to leave it in as a dust cover. When it was new, I put mine religiously back in the box. Now, its just lumped on the desk. Just make sure wherever you place it that the lenses don't get any sunlight on them. Screens will burn like an Ant under a kids magnifying glass. I have a Vive. I saved the deluxe strap mount that came with the box. Used a couple of double-sided tape to mount it on the desk. 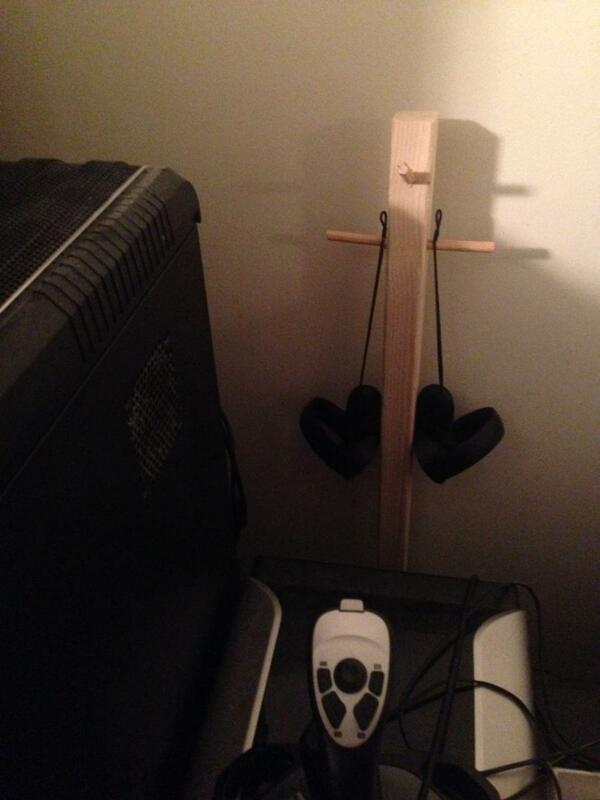 Instant ghetto headset mount. Haha! Hey it works, not bad! Mine just sits on the desk. I have little VR box I bought especially for this. It is stored there, it has a canal the cable runs through so it can stay connected, and the box has the nice side effect that no dust gathers anymore in or on the headset and its lenses. Saves a lot of time, I barely need to clean the lenses anymore from dust or the cats' fur. I used to use the original box but now I just lay it on top of an old PC case I have next to my PC, I ensure the lenses face away from the window though. One thing I have noticed. Previously when I had mine laying upside down on my desk, often when I would put it on and Oculus Home started up, I would get a sensor error on one sensor. Usually the same sensor. I would unplug it from the usb and plug back in and all was well. So far , since I started storing it in the case a few days ago, that has not happened again. Strange, but kind of nice hope it stays this way. dburne, you can exclude the ovrservice from the starting processes, and use ott on autostartup to check if it worked. It's good to keep the service off to save resources and avoid an involuntary triggering of the sensors as well. Then if you want to start it up, you're just a click away. No need to crawl around the table or stretch for USB /hdmi connectors. If you can find one of these https://produkte.k-m.de/en/Accessories-for-stagestudio-and-home-recording/Headphone-holder/16085-Headphone-holder-with-table-clamp-black they fit perfect for the Rift so that lenses always face down not collecting dust. I use this type of guitar hanger. Bought it on eBay for 3-4GBP. I hang my Rift with lenses facing the floor so they don't get covered with dust.  which I have been using ever since. While it does use up more desk space than an under the desk solution, I find it holds the Rift HMD in a nice safe and easy to get to position.